New Murrieta Mayor Harry Ramos (right) presents a certification of appreciation to outgoing council member Gene Wunderlich. After all of the drama over the past several weeks and a hotly contested election, the city of Murrieta has a new mayor and council member. 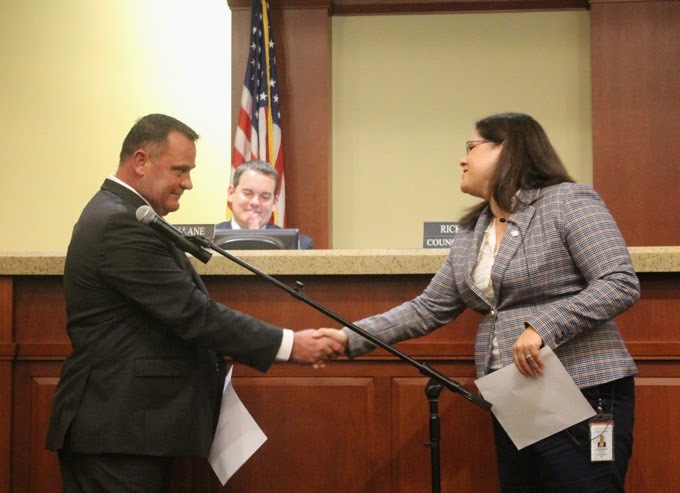 In a decision described as re-establishing protocol, council members unanimously elected mayor pro tem Harry Ramos to the position of mayor at their meeting Tuesday night. Randon Lane -- the other council member whose seat was not up for election last month -- was selected mayor pro tem. 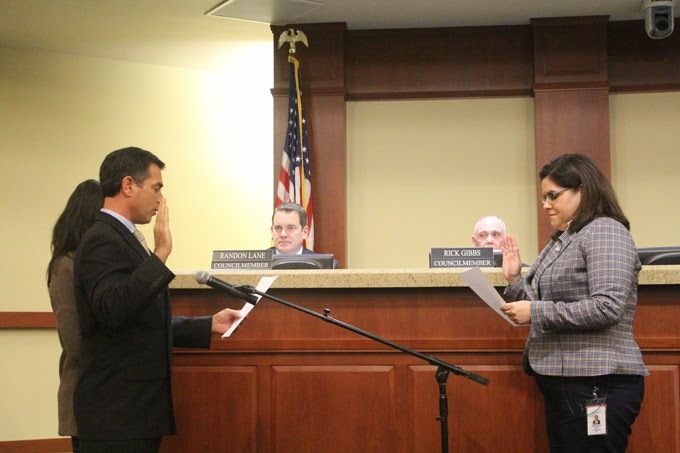 Meanwhile, those receiving the top three votes in the Nov. 4 election were sworn into office. That included re-elected Rick Gibbs, newly elected Jonathan Ingram (left) and former mayor Alan Long. Long, who faces a court date later this month to answer a felony DUI charge from an injury accident in October, was applauded by a majority of the audience as he returned to the dais -- not long after resigning the last few weeks of his term as mayor. Ramos did not take the position of mayor without words of caution from a fellow council member. Gibbs was outspoken in his belief that although he questioned Ramos' qualifications for mayor, it was necessary to return to the rotation policy of council members ascending to the mayoral position. Gibbs voiced his disagreement with the way the council handled the situation in December 2013, when mayor pro tem Kelly Bennett left the council and Ramos -- with virtually no experience -- was named mayor pro tem in her place. "The experience and knowledge to be a successful mayor are possessed by three people on the dais side -- Mr. Lane, Mr. Long, and myself," Gibbs said. 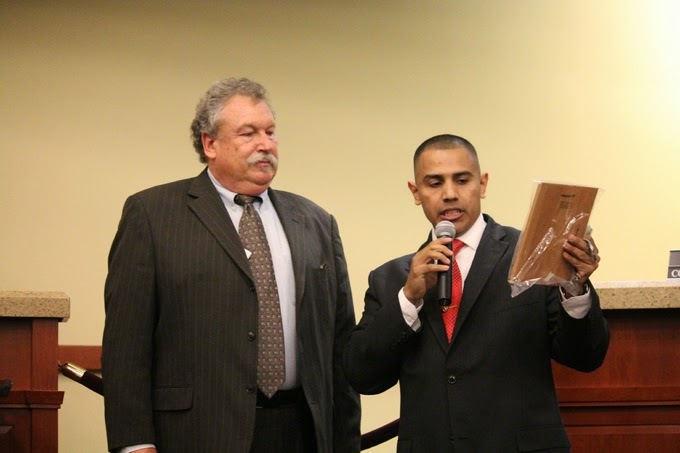 He pointed out Ramos' inexperience in conducting council meetings, his refusal to provide a biography for publication on the city council website, and his lack of participation in subcommittee meetings. Before nominating Ramos for mayor in an attempt to re-establish protocol, Gibbs said that he hoped Ramos would succeed as a mayor, but he had a lot of work in front of him to do so. Two members of the public, during time set aside for public comments, voiced their concerns about Ramos' new role in the city government. Echoing the concerns of the citizens, Gibbs said, "As we all know, the [previous] decision shattered the council harmony that existed for seven years. This put staff on guard. Without cohesion, there is a lack of stability. It put the development community on guard as well and it hampered our economic development thus. Investors like certainty and we gave them uncertainty." Newly returned to the dais, Long (right) offered his perspective on the mayor's position. "The success of the mayor is a reflection on us and the city, and that is our role in our job despite our differences," he said. "We need to constructively disagree on the dais, but at the end of the day, we hold each other up for the betterment of the community and the success of Murrieta." Ramos was brief in his response to the criticism. "I do not want to be divisive to my colleagues," he said. "I might make some statements, I'll say quite honestly, rookie statements, in my time as a council member. It is a learning process. My goal is to be a fully accessible, productive, honorable individual sitting in this seat. That is my goal and that is my promise to my constituents." Before the newly elected council members were sworn in, council members joined together to thank outgoing council member Gene Wunderlich for his service in stepping in as an interim councilman. "It was truly an honor and privilege for me to serve in this capacity," Wunderlich told the audience. "It was also a great pleasure ... most of the time," he joked. "It was a valuable learning experience." After a short break, the newly elected council members briefly addressed the audience. "I'm going to work for all constituents of the city of Murrieta," said Ingram, elected for the first time. "I'm going to work to build consensus and work with my fellow colleagues on the dais. I've spent the vast majority of the year meeting thousands of people in Murrieta and I can only tell you, home is where the heart is, and Murrieta is my home and I plan to earn your respect." Long was concise in his comments. "Moving forward, what I intend on doing is collaborating and putting five minds together, to create a better outcome than what one mind can do on its own," he said. "This is what I have done in the past, this is what I'm going to do now, and it's what I will do in the future."